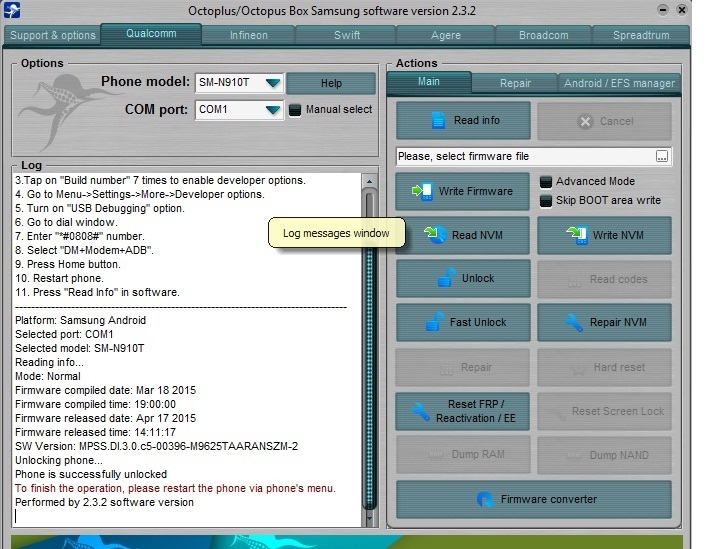 Samsung N-910T unlocking detailed info,image and log here. some of you have a question what the root is and what it happen after root. first you have to download TWRP file from this link .Download the appropriate file for selected model. 3.Tap on “Build number” 7 times to enable developer options. 5. Turn on “USB Debugging” option. 11. Press “Read Info” in software. To finish the operation, please restart the phone via phone’s menu. Here is the root process. By Odin. Final preform success by Octopus box . Battery must be 50% over charged. Read code function still not working at this model.So use only press fast unlock bottom. Need to be backup certificate file and need to be rooted. Insure that FRP lock is off .If you got a lock .Method how to remove Frp lock on Marshmallow version running android version. .Keep in touch with us. How to Process TWRP Recovery Method.